I have been invited to speak at the upcoming MAICSA (Chartered Secretaries of Malaysia) Annual Conference 2016. The conference is on 8 and 9 August 2016 at the Sime Darby Convention Centre. I am honoured to join a long list of distinguished speakers drawn from the Companies Commission of Malaysia, Bursa Malaysia, and public listed companies. I will be speaking on 8 August at the Plenary 2 session. 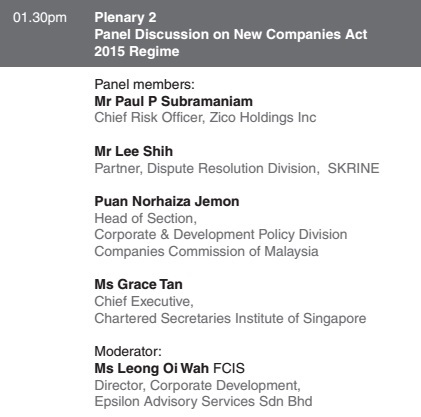 It will be a panel discussion on the new Companies Act regime. The Dewan Rakyat, the lower house of Parliament, passed the Companies Bill 2015 on 4 April 2016. It was first tabled for Second Reading on Thursday 31 March 2016 and Parliament continued and concluded its debate on 4 April 2016. I had previously written on some of the upcoming changes, especially on the challenges that directors may face and I was also featured on The Edge TV. The new Companies Act will undoubtedly transform Malaysia’s corporate landscape. Underpinning the changes are the aims of spurring entrepreneurship, making the corporate vehicle more attractive for businesses, deregulating certain aspects of the corporate process, and to introduce the concept of corporate rescue for ailing companies. It is anticipated that the new Companies Act itself will not be brought into force until a year’s time or so. This is because the new regulations, rules and guidelines will still need to be drawn up. I set out below 7 of the more significant areas we will see in the new Companies Act. 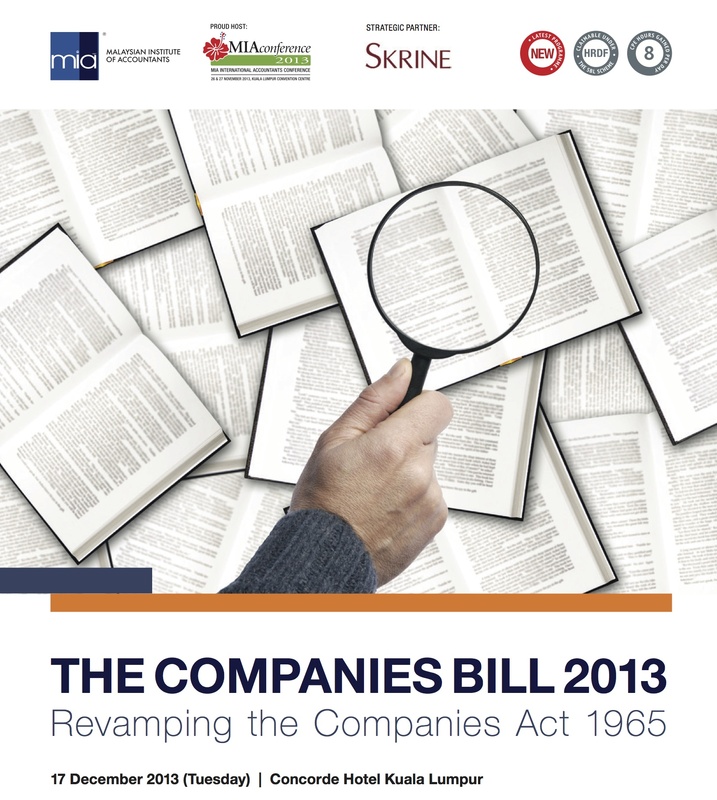 For those interested, the Companies Bill 2015 has finally been released. It clocks in at 628 pages (solely for the English version), 610 clauses, and 13 Schedules. Do note that the English version will be authoritative text of the Bill (see P.U. (B) 403/2015 under the National Language Acts 1963/67). From my quick reading, the Companies Bill 2015 does differ from the 2013 consultation copy issued by the Companies Commission. There have been improvements and tweaks made to several of the sections, while possibly leaving some lacunas. Will cover more of the areas in future posts. I have to soon say goodbye to oft-used sections like sections 176, 181, 181A, and 218 under the Companies Act 1965 and then memorise new sections. I was interviewed by The Edge Financial Daily and I shared my views on some of the challenges that directors will face under the upcoming Companies Bill. “It’s not an easy balancing act to be done. But if you are speaking from the perspective of minority shareholders or even shareholders, I would say they will be welcoming these changes because there is more information, and the directors have to allow a platform for the shareholders to discuss, query, ask questions, even if it’s not contained specifically in any audited accounts. “Free flow of information is quite welcomed,” Lee told The Edge Financial Daily after presenting his paper “New Companies Bill: Upcoming Changes and Impact on Directors and Shareholders” at the Malaysia Legal and Corporate Conference on Oct 7. My views in The Edge were also briefly discussed on the BFM Morning Run. It appears from the Parliament website that the Companies Bill 2015 was tabled for its First Reading on 19 October 2015 and its Second Reading on 20 October 2015. We are now close to ushering in the new laws. I will be giving a talk to the Malaysian Institute of Accountants on 17 December 2013 entitled ‘The Companies Bill – Revamping the Companies Act 1965.” The Companies Bill is a significant revamp of the Act and having spoken informally to some of the officers from the relevant authorities, it does appear that they are keen to push through this Bill as soon as possible and to have it tabled before Parliament some time next year hopefully. The version of the Bill I have included in this post is the draft which was released for public consultation. There will likely be a number of amendments (including typographical as well as certain gaps to be plugged) but I expect the main provisions to still remain the same. In my slides, I have referenced some background reading material which will shed light on the rationale behind many of the provisions in the Bill. This makes for very useful reading when trying to interpret the Bill. The material are the Consultative Documents (CD) which were issued in 2007 explaining the recommendations for changes to the Act and seeking for feedback. With the responses, the Corporate Law Reform Committee issued its Final Report in 2008.